Hawkes Bay's top reggae band - The Rude Boyz - fresh off their supporting act slot with NZ leading reggae band Katchafire in Napier two weeks ago - are bringing the reggae roots back to Hastings. 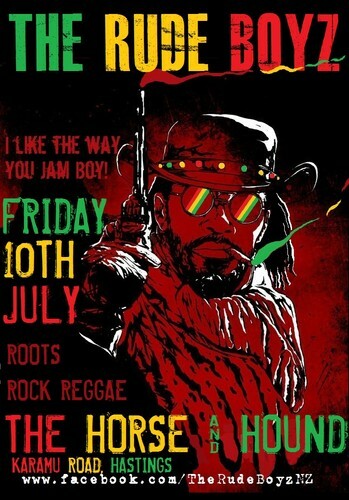 They are performing for the first time at Hastings' premier music venue and pub The Horse and Hound. They going to hit with a combination of original roots, rockers reggae such as 'Bring the Roots Back', 'Spiritual Poverty', 'Feeling the Vibes', 'Rude Boy, 'Uptown Girl' and 'Run for Cover' as well as covers of your favorite reggae artists such as Bob Marley, Peter Tosh, Gregory Issacs, Denis Brown, Jacob Miller and Third World.